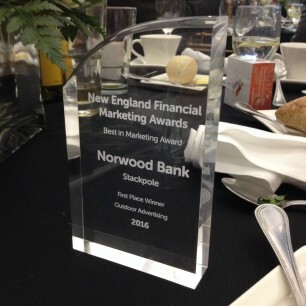 Norwood Bank’s “Boundless Banking” introductory campaign was honored by the New England Financial Marketing Association at their 2016 “Best in Marketing” Awards show. The Bank received 1st place in the Creative Assets: Outdoor Advertising category, in a field of great financial marketing work. Stackpole is proud to work with innovative bank marketers like those at Norwood Bank, allowing us to form a partnership that produces great work from our collective team.